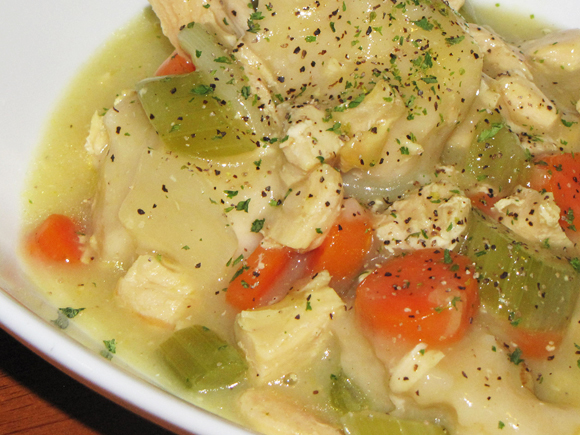 Chicken and dumplings is a classic that has taken on so many different variations over time. It really comes down to the basics though: chicken, dumplings and a gravy. It's one of those meals that is always good. Kind of like pizza. (You know what I mean, right? 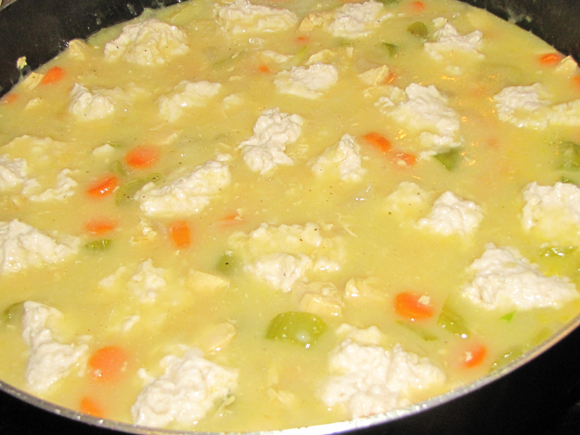 Even when it's bad, it's still good...) Well, chicken and dumplings is so good at delivering comfort and warmth and happy thoughts and.... Well, I could go on and on but I'll just get to the good stuff. Before you read too far into this post, please note that this is chicken and dumplings. It is not chicken and dumpling soup. 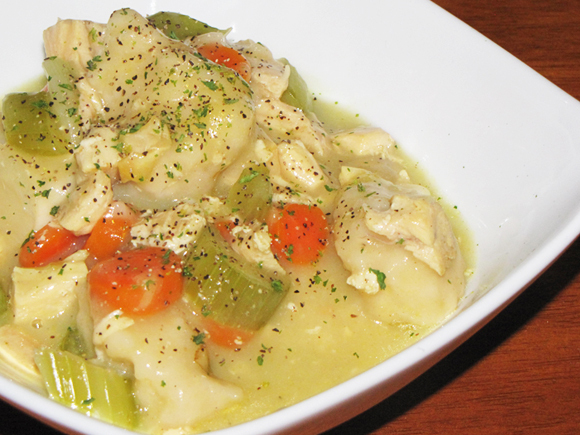 While this recipe can easily be converted to a soup (and chicken dumping soup is pretty awesome), the purpose of this particular dish was to get all the yumminess - chicken, veggies and dumplings - without the broth. My version takes the classic but adds tons of veggie, has a healthier 'gravy' base and is super easy because it's all cooked in one pot on the stove. I cook the chicken first to get a nice brown color that adds flavor. It still produces tender pieces that seem like they've been slow cooked for hours. Next, the veggies get a quick saute in the same pan the chicken was cooked in. This is to brown them slightly and bring out their natural sweetness. 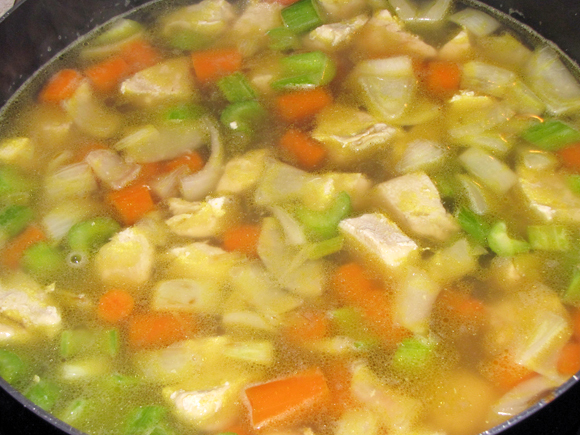 The chicken gets added back to the pan along with the chicken stock. They all cook up together until the vegetables are nice and soft. When the vegetables are soft, the thickening mixture is added to create the 'gravy' and then dumplings are dropped right on top. The dumplings will absorb all the flavor from the chicken and vegetables leaving little bundles of awesomeness. 3 chicken breasts, cut into 1 1/2" large chunks. 1. 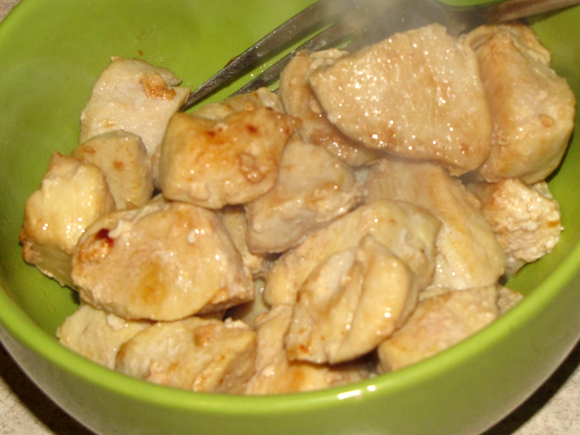 Cook chicken in oil until brown and no longer pink over high heat, stirring occasionally. 2. 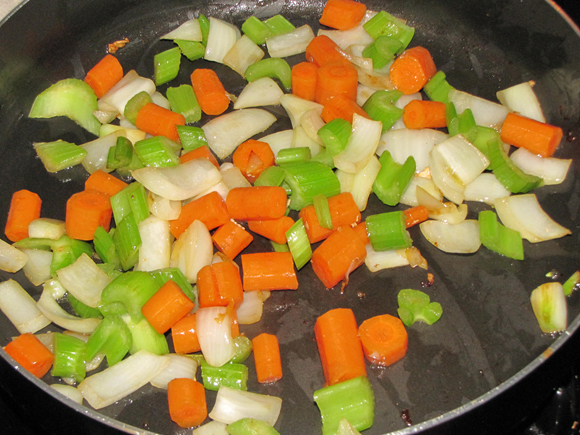 Remove with slotted spoon and add vegetables to same pan. 3. Cook vegetables over med-high heat until starting to brown, stirring occasionally. 4. Add chicken back to pan and then add stock. 5. Simmer for about 20 minutes or until vegetables are soft. 6. While this cooks, prepare the dumpling mixture in a separate bowl: Dice butter into small pieces and using a pastry cutter or your fingers, mix with flour, salt and baking powder until the mixture looks like breadcrumbs and there aren't any large pieces of butter left. Add milk and mix until just moistened. Don't over mix. 7. Next, make the thickener: Mix 1/2 c milk and 3 TB cornstarch together in separate bowl or cup. When vegetables are soft, slowly add to simmering broth, mixing as you add. 8. Drop dumpling mixture by large spoonfuls on top of chicken mixture in pan. 9. Cover with a tight-fitting lid and cook for 20 minutes or until the dumplings are cooked through. Turn them over halfway through cooking time to ensure even cooking.